Whispers in the Loggia: Warsaw: Second Time's the Charm? After two months of waiting and intensified scrutiny, B16 has named Bishop Kazimierz Nycz of Koszalin-Kołobrzeg as the new archbishop of Warsaw. Born in 1950, the archbishop-elect succeeds Stanislaw Wielgus, who resigned moments before his scheduled installation liturgy amid reports of his collaboration with Poland's Communist-era secret police, the SB. Since Wielgus' Epiphany Day hara-kiri, Cardinal Jozef Glemp, whose retirement as archbishop was accepted on his initial successor's appointment in December, has been serving as apostolic administrator of Poland's largest local church. Shortly after his priestly ordination in 1973, Nycz was recruited into the service of the chancery of Krakow, where he eventually became vice-rector of the major seminary and was named auxiliary bishop in 1988. 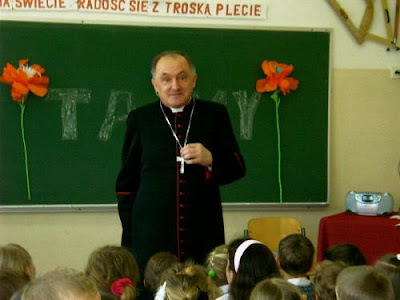 He was named bishop of Koszalin-Kołobrzeg in 2004 and serves in the Polish episcopate as chair of its Committee for Catholic Education and a member of the national conference's influential Permanent Council. Per the norms of canon law, the second Warsaw installation of the year must take place in St John's Cathedral within two months of this morning's appointment. However, given the tumult in the archdiocese and the desire for a quick settling-down, it's been foreseen that Nycz will have taken canonical possession in advance of Easter.